This past week I’ve been feeling a bit off – the flu has been around my work place so it was only a matter of time before I got it. Friday I woke up feeling particularly sick, so had a nice day at home to rest and get better. I even had dinner made for me! I had always wanted to cook pork belly, especially the crackling bit, so Colin went and bought “a beautiful piece of pig”. 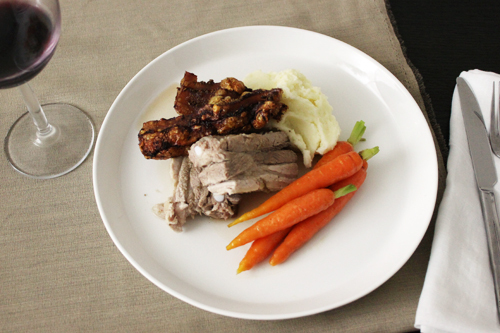 Together we cooked roast pork belly with honey glazed carrots and potato mash. We found a recipe from the Taste website (original here) and only had to alter it slightly. The carrot and potato idea came from a restaurant in Perth, BarOne, where I had a similar dish. I’d never made honey glazed carrots before so looked around a bit, got the jist of it, then just made the rest up. The sweetness of the carrots really cut through the salty-fatty taste of the pork. And the potatoes were lovely balance too. I’ve included how to make the carrots, but potato mash is pretty standard so I’ll leave that up to you. So first time making pork belly – any dramas you ask? Of course. I have a really old oven. It’s electric and heat only comes from the bottom, and there is no fan. Cooking things where the top needs to brown can be a little difficult. Getting crackling on roast pork, almost impossible. After the pork had been in the oven for an hour, the skin was still soft and jelly like – Colin almost threw in the towel. I’ve had stuff ups in my oven before, so I was determine to not waste this amazing meat. I remember seeing a chef on TV peel skin off a roast pork and placing it back in the oven to crisp up. I also remember Jamie doing it to the skin on a piece of salmon. So we pulled the roast out of the oven, carefully peeled the skin off with a knife, put it on some paper on a flat tin and placed it under the grill. Hallelujah! The skin came out amazing. It was so crunchy and salty and just delicious. I was so relived it work, not to mention we had successfully cooked our first pork belly. Clean the pork and cut off any bits of hair or extra skin. Score the pork length-ways, without cutting into the meat. Place the pork on a rack over the sink and pour over a full kettle of boiling water. This will give you a nice crackling. Dry the meat with a clean towel. 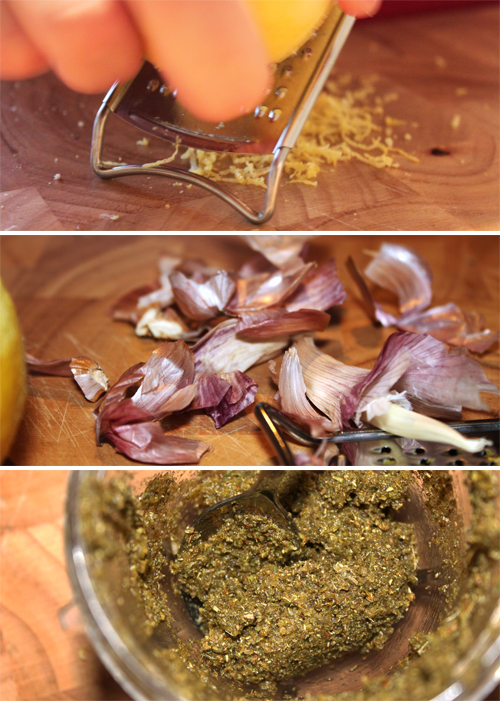 In a mortar and pestle or a food processor, crush the rosemary, fennel, lemon zest, garlic and oil until you have a thick paste. Rub the paste into the skin, making sure you get into the cuts, then cover and refrigerate overnight is possible. Place the pork in a roasting pan and pour over the while wine. Then rub the sea salt into the skin, and place in the over for 30 minutes. After 30 minutes, reduce the heat to 160°C, take the pork out, scatter the onions around the pan, then place the pork back into the oven and cook for a further 1 hour until skin is crisp and juices run clear. Take the pork out of the oven and let it rest, covered, for 15 minutes. If the skin doesn’t crisp up, carefully cut the skin off and place under a medium grill for 15 minutes. Strain the juices from the roasting pan and bring to a simmer in a small saucepan. Remove from the heat when it becomes thicker. 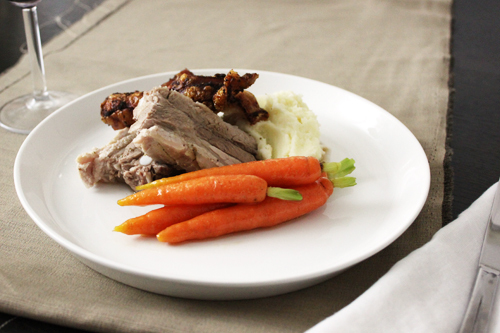 Slice the pork and serve with baby carrots and potato mash. Clean the carrots well and cut off the green ends, leaving around a centimetre still intact. Bring a large pot of salted water to the boil, then add the carrots and cook for 2-5 minutes, longer for large ones, shorter for little ones. In a medium saucepan, add a splash of olive oil and the butter. When the carrots are ready, add them to the saucepan, and then add the honey and pinch of salt. Toss the carrots in the sauce for 5 minutes. Take off the heat and serve immediately with the pork.